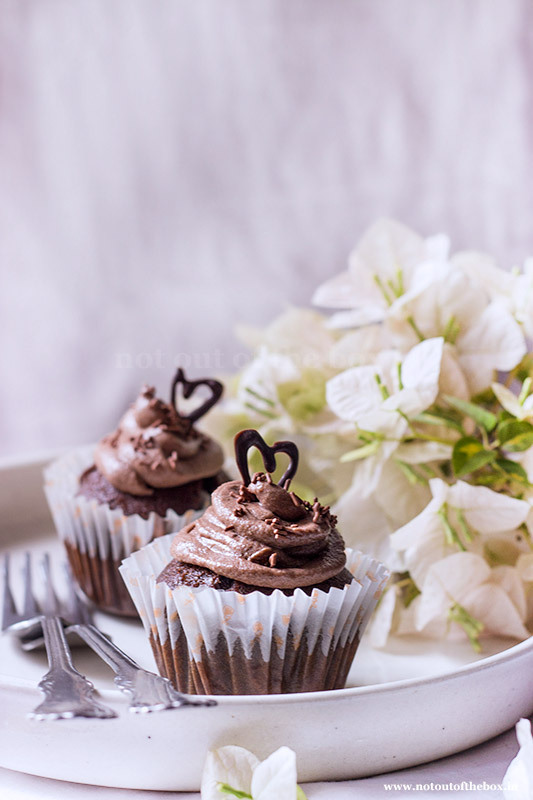 These eggless Chocolate Beetroot Cupcakes are made with the goodness of beetroot and olive oil. They are moist and delicious in taste. 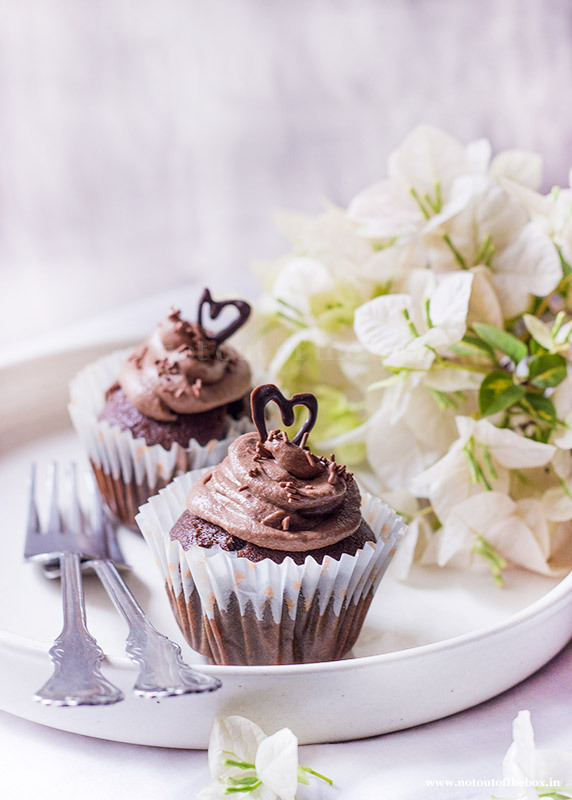 Topped with the easiest fudge frosting, these can be whipped up in no time. Peel 2 medium sized beetroots. Chop them roughly. Grind them with ½ cup of water using your mixer/grinder until a thick watery paste forms. Strain and keep aside the juice for later use. In a bowl shift all-purpose flour, unsweetened cocoa powder and salt, keep aside. In a separate bowl mix yogurt, sugar, baking powder and baking soda. Wait for 2-3 minutes. The mixture will become little frothy, now mix in oil and vanilla extract. Add the flour mixture into this in 3 batches. And keep whisking. Now add beetroot juice, whisk well to form a lump free batter. Preheat oven to 180C. Line a cupcake/muffin tray with paper liners. Scoop the batter into the prepared cupcake tray. 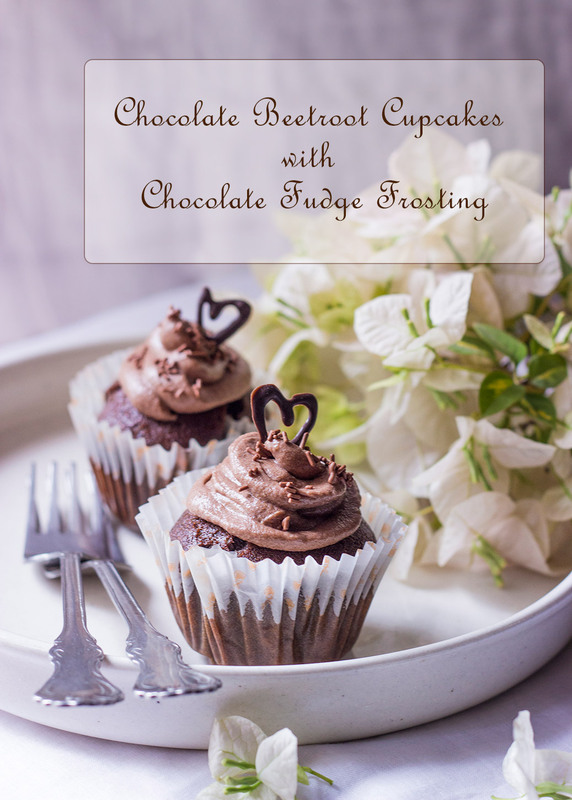 Fill each cavity ½ or 2/3 full with the batter to get perfect cupcakes. Bake for 22-25 minutes or until a toothpick inserted in the centre comes out clean. After baking transfer the cupcakes to a cooling rack and leave there until they cool completely. Using your hand mixer/stand mixer cream the butter first. Shift icing sugar and cocoa powder directly into this mixing bowl. Mix further until everything incorporated well. Now add milk and vanilla extract. Keep mixing on medium speed for 3 minutes. The frosting will be smooth and fluffy. You can use this frosting immediately to frost cupcakes. This frosting stays well up to 10 days in the freezer. Store it in an air tight container. Before using, bring it to room temperature.